— Widest section has five lanes retained but no cycle paths. — Consultant architects said they were told not to change the roadway. — “Traffic dominated” but dealing with traffic levels outside project “remit”. Dublin City Council are proposing new public realm scheme at Dolphin’s Barn without providing for cycling for all ages as promised in the City Development Plan. IMAGE: The junction between Dolphin’s Barn and South Circular Road includes a large amount of space, but none dedicated to segregated cycling. The project follows the trend set by public realm upgrades in recent years in Kilmainham and Rialto which have been problematic for cycling, with complaints from residents and people who commute to or via those areas. 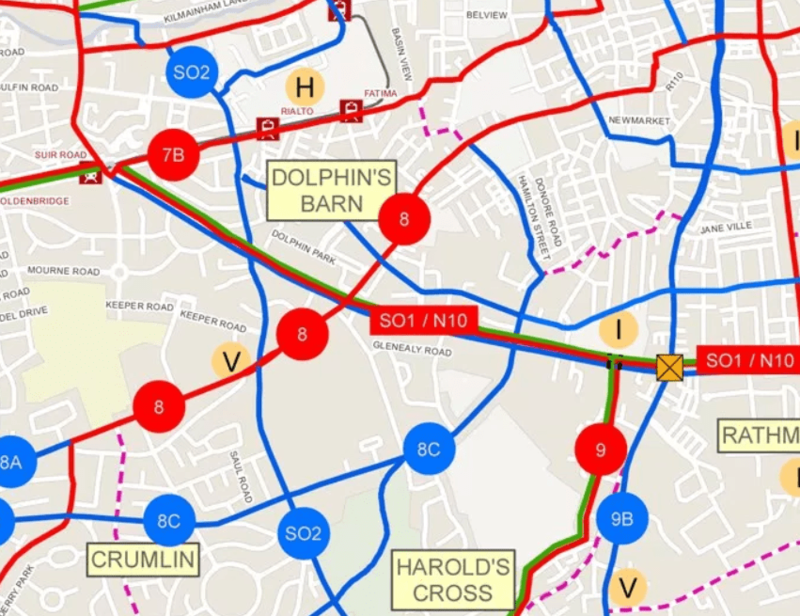 The project in Dolphin’s Barn is to cover the main streets of Dolphin’s Barn — South Circular Road going east-west and Dolphin’s Barn north-south (leading to Crumlin Road to the south and Cork Street to the north). It is due to go to public consultation in the near future. The plan includes raised pedestrian crossings and the removal of a slip turn, but no cycling infrastructure suitable for all ages. Short and narrow sections of cycle lanes would be repainted into the new scheme. When the work was discussed at the South Central Area Committee on Wednesday 17 of January (SEE: webcast recording and PDF of the presentation), only one councillor raised the issue of cycle routes. Cllr Michael Mullooly (FF) and Cllr Pat Dunne (Independent) also raised the issue of how the area was traffic dominated and questioned if the scheme would address this. The councillors said that motorists abused the bus lane and that traffic speeds were often high. Despite Dolphin’s Barn being one of the wider sections of any routes into the city centre council, a council official defended the lack of cycle lanes because of “fairly limited road space”. IMAGE: Dolphin’s Barn / Street is planned to be a section of primary cycle route number 8 in the GDA Cycle Network Plan. Council official David Healy told councillors that: “In terms of the cycle lanes, the problem that we have is that we have fairly limited road space and we have not transformed it too much because we’re slightly hamstrung, we can’t make it any wider. 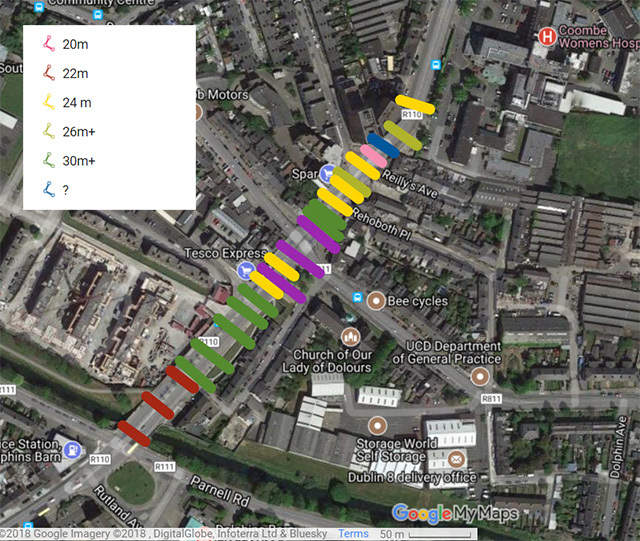 Desktop estimates of the street widths, estimated by IrishCycle.com (see below), shows that cycle paths can fit along side wide footpaths, bus lanes and single traffic lanes in both directions. This website understands that road safety audit issues with the Kilmainham Civic Space are on-going with the project which was supposed to be finished two years ago. Previous in the presentation, Haslam said that the area is traffic dominated and he added that the volume of traffic was not in “within the remit” of the project. Examples of what can fit in the two smaller widths — these are purely examples to show that — roughly — that cycle paths can fit along side wide footpaths, bus lanes and single traffic lanes in both direction. 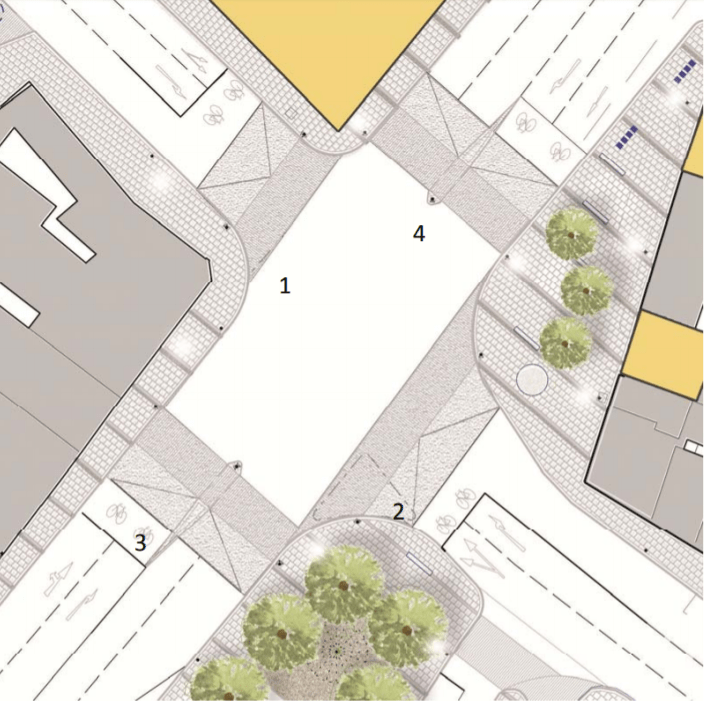 However the workable width along most of the scheme is at 24 metres or wider — much of the widths are 26-30 metres or more, allowing easily for seating, tables and chairs, greenery, bus stop bypasses etc. Gobshites. They really really really need to get in urban planners from the Netherlands and teach them how to do this stuff right. You are completely right Citizen Wolf! I’ll bet Mike Haslam is never on a bike! Dublin City Council, both councillors and officials, are contributing here to further serious injury and loss of life of people cycling by failing once again to provide safe useable space for cyclists. This inaction is criminal and inexcusable especially with all that road space to reallocate away from the highly inefficient and life threatening private car. Can we hold them accountable to the next unfortunate death or maiming of a person who chooses to cycle ? It’s about time we did. Inaction has life changing affects on the victims and their families and communities. Not acceptable when the solutions are there ! Excellent analysis keep it up and send it on to the powers that be. jaysus wept why is this so complicated. I said it before at the motorway around the Croppy Acre as part of the Liffey ‘Cycle’ route – DCC Roads Dept has zero consideration for pedestrians and cyclists. Can an appeal be made to DCC for contravening their own Development Plan? Citizen wolf is right – we need to remove Irish engineers and planners from design decisions. This is why the allocate for cycling campaign is so flawed – these are the people who will be spending the money. Ridiculous, not allocating cycle lanes means we will occupy normal lanes and bus lanes. Might have to revisit the “cycle bus” idea for safety. by what or who they hamstrung? @dublinstreams by the good old politics of space. The problem doesn’t seem to be the architects or engineers, but the council officials who are in thrall to interests not at all working for the good of our civic health.